The simple straight lines associated with Shaker styling are self evident in this beautiful Pencil Post Bed. The headbaord and footboard designs are offered in several styles, or may be custom designed to suit. The pencil post bed gets its name from the slender pencil-shaped bed­posts. 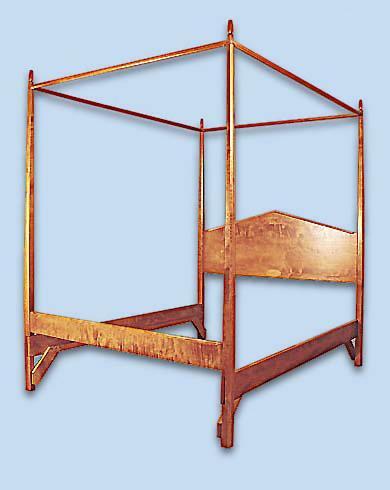 Posts are 80" high and if bed is ordered with canopy and finials, the overall height is 86". The canopy has steel rod reinforcing, guaranteeing it's strength and durability. The bed runners are solid wood dado jointed in, with angled braces insuring a very strong piece of furniture. This runner design is used in every bed we build. Shown in lightly figured curly maple, our pencil post beds are available in all woods with other bedroom furniture to match.